Chromatography is an analytical technique that is used to separate mixtures by distributing the components of a mixture between a stationary phase and a mobile phase. Columns are used in various types of chromatography, but improvements in nanotechnology have been focussed around liquid chromatography (LC) and gas chromatography (GC). Nanomaterials are defined as those that are less than 100nm in size. Traditional high-performance liquid chromatography (HPLC) uses particles that are micrometres in diameter, but the pore size is in nanometres. In GC, the film thickness of the stationary phase in capillary columns ranges from micrometres to nanometres in size. The idea of miniaturisation for gas chromatography has been around since the 1950s and for liquid chromatography since the 1960s. Nano-LC was first introduced in 1988 and the idea of chip based and microelectromechanical systems for gas chromatography columns is currently improving the way we use GC. Liquid chromatography separates components in a mixture using a liquid mobile phase and solid column stationary phase. 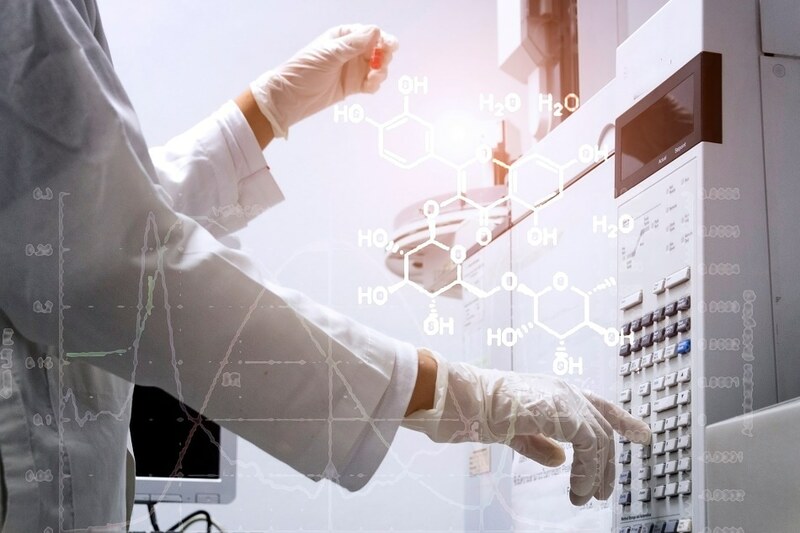 Whilst column chromatography has been around since the early 1900s, it wasn’t until high performance liquid chromatography (HPLC) was invented in the 1960s that faster separations that no longer took hours became possible. The mode of HPLC and the columns used depends on the polarity of the analyte of interest. Two of the most common modes are normal and reverse phase chromatography. Normal phase uses a polar silica based stationary phase, whereas reverse phase chromatography uses non-polar modified silica columns such as C8 or C18. Ultra-high-performance liquid chromatography (UHPLC) is a method of liquid chromatography first introduced by Waters in 2004, and it gives a better resolution and efficiency due to the different columns and instrumentation used. Traditional HPLC columns are typically 4.6 mm and between 150 to 250 mm in length, whereas UHPLC columns are a lot shorter with smaller sub-2-micron particles. Due to the high pressures in UHPLC, separate instrumentation is also required. An alternate to UHPLC are the fused core particle columns, which allows the use of HPLC systems at twice the speed and efficiency of traditional columns whilst being at half the backpressure of sub-2-micron columns. Fast separation and good resolution are key factors for laboratories using liquid chromatography, so ways to improve the columns and instrumentation being used such as nano-LC is an area of research that has been of great importance over the past decade. Gas chromatography is a technique that is used to separate thermally stable volatile compounds within a mixture. It works by using differential migration of a sample through a column containing a solid or liquid stationary phase by a gaseous mobile phase. The columns are either long capillary columns with the stationary phase coated on the inside of the wall, or shorter columns with a larger diameter that are packed with a particulate stationary phase. The movement of the compounds through a column is dependent upon their distribution ratios, which are inversely proportional to their volatilities. Most GC applications use capillary columns, with wall coated open tubular columns (WCOT) being the most popular option due to their high resolution and efficiency. Miniaturisation of gas chromatography systems and columns using chip-based systems and microelectromechanical systems is allowing for faster analysis of volatile compounds with GC. Nano-LC is an alternative to traditional liquid chromatography that is still being explored. The columns in nano-LC are between 10–100 µm in diameter compared to the larger columns used in micro-LC and capillary-LC, and the flow rates are in nanoliters. Nano-LC columns are generally 75 µm in diameter to provide a compromise between sensitivity, robustness and loadability, and the particle sizes for packed nano columns are between 3 and 5µm. The alternative to the packed columns is monolith columns, where a porous structure is formed throughout the column and is fixed to the column wall. Nano-LC offers the benefits of working as a miniaturized LC system but with UHPLC capabilities. The decreased size in nano-LC allows for an increased sensitivity and the fact that nano-LC keeps the sample concentrated means more sample is delivered to the detector. Nano-LC also has a more efficient ionization of the sample when coupled with mass spectrometry, due to the decrease in flow rate meaning there is no need for the nebulization gas used in traditional liquid chromatography mass spectrometry. A lower flow rate also means that less solvent is needed for analysis. Nano-LC can be used for all the same types of analysis as other LC systems such as proteomics, forensic and drugs analysis, but it has been a big development for proteomic analysis due to the sensitivity it provides. A major disadvantage to nano-LC is like UHPLC when it first came around, the equipment to be able to use nano-LC is still very expensive. There is also a poor range of columns to choose from compared to traditional LC. Gas chromatography columns can be miniaturised using microfabrication techniques. Traditional GCs have conventional silica or stainless-steel columns with an immobilized or a cross-linked stationary phase bound to the walls. Miniaturized GC and planar columns etch channels into a substrate instead of by using capillaries. Channels can be easily etched into silicon and glass chips, but the stationary phase then needs to be fabricated inside the channel under conditions of extreme miniaturization. Fabrication methods for MEMS include using polymer coatings, carbon nanotubes, gold nanoparticle layers and ionic liquids. The performance of MEM based systems is then theorised based on the Van Deemter equation. MEMS consume less power and allow for very narrow widths that improves separation efficiency. The potential to make micro-gas chromatographs mobile is advantageous for many fields, including analytical chemistry, environmental analysis, defence and the food industry. A miniaturized GC (µGC) has three important components, which are the injector, a micromachined column and a single detector. A chip-scale GC system has been developed that combines all three of these components on to a single chip. The chip scale GCs have loading times of only a few seconds and analysis can be performed in less than a minute over a wide range of boiling points. It is good for rapid analysis of compounds in real-time situations and has a low fabrication cost.